Tommy Martin at Vic's Gym. 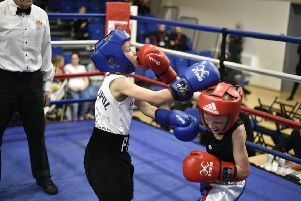 A champion boxer has launched a search for a new star in Peterborough. Former English and WBA Continental super-lightweight title-winner Tommy Martin is now based at Vic’s Gym in Hampton. The 23 year-old has turned his attention to training after seeing his promising professional career cut short by a head injury. Martin suffered a bleed on the brain in a headline Commonwealth and WBC International title battle against John Wayne Hibbert in London, in January, 2016 – the only defeat on a 14-fight record for a man tipped by many to reach the top. He has battled depression since announcing his retirement in October, but is now fully focused on returning to the top of the fight game by plotting the career of a protégé. Martin said: “I’ve had to come to terms with the fact that I can’t fight again, but my love and fire for boxing is still there. Thoughts of getting out of the sport are always cropping up, but there is something special about it that keeps me hooked. “I just can’t let it go, so I’ve got my training licence and I want to live my dreams through other boxers. “I will have no trouble in spotting the talent and I’m confident I have the right characteristics to create a boxer capable of winning titles. “I learned so much from a great trainer in Barry Smith. I’ve got that knowledge to pass on and Vic’s Gym is a great facility in which to do it. “All I’m looking for is someone with the commitment and desire to make it as a pro fighter. “It could an amateur, it could be someone who has just turned pro, or it could be a total newcomer to the sport. Martin is from St Neots, but is well known in and around Peterborough. He was a highly-rated goalkeeper in the Posh youth system, but turned down the offer of a scholarship at 16 to concentrate on boxing.